This tutorial will show you step by step how to unblock blocked websites in a few different ways by using tricks, free software, online services, and applications. When you're bored at your office, school, or at home, and have some spare time, then you might want to go online and visit your favorite site, like Facebook, YouTube, Twitter, Vimeo, Yahoo, Gmail, VK, Reddit, Pinterest, Google, LinkedIn, or another website to check your email, check what your friends are sharing, watch videos, play video games, chat with someone, or do other things online. So you open your web browser and visit your favorite website but then you find out that the site is blocked. You might get one of the following messages in your web browser: DENIED, ACCESS DENIED, This site can't be reached, Hmm. We're having trouble finding that site. We can't connect to the server at vimeo.com. or Hmmm...can't reach this page. There are schools, companies, and countries that block certain websites like social media, video sharing, political, news, and adult sites. When it happens only at work or at your school, then it's probably blocked by the network administrator of the company or school. There are also countries where governments (authorities) block certain websites. In most cases, you can try a few different methods to unblock websites that are blocked. Many people use a proxy site, but you can also unblock websites without proxy sites. On this page, I will show you how to bypass and access blocked websites in a few different ways. A VPN (Virtual Private Network) is a network technology that allows you to create a secure connection to another network over the Internet. A VPN can be used to access region-restricted websites, shield your web browsing activities on public WiFi networks, and more. There are many paid and free VPN services and applications for Microsoft Windows, Mac OS X, Linux, Android, and iPhone (iOs). Most VPNs are very easy to use. Some VPNs (like Windscribe) also offer a browser extension for Google Chrome and Mozilla Firefox. The Opera web browser has a built-in ad blocker, battery saver, and a free VPN with unlimited data. You can download Opera Web Browser here. 2. Click on the Opera logo (top left). 3. Click on Settings (Microsoft Windows and Linux) or Preferences (Mac OS X). 4. Click on Privacy & Security located in the left menu. 5. Check the checkbox next to Enable VPN. A VPN icon will appear next to the address bar of the web browser. 6. You can turn the VPN on and off by clicking on the VPN icon. 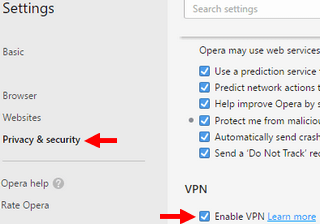 Opera's VPN allows you to choose from a few locations (e.g., Europe, America, Asia, etc.). 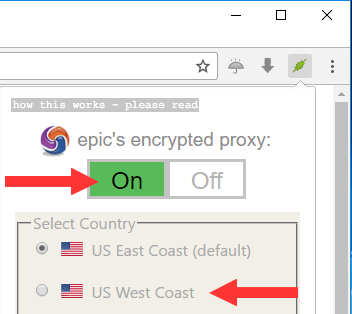 Epic Privacy Browser has a built-in encrypted proxy. You can download Epic Privacy Browser here. 1. Open Epic Privacy Browser. 2. Click on the red plugs icon located at the top right of the browser. 3. Click on the On button. Tor Browser is a web browser that protects you by bouncing your communications around a distributed network of relays run by volunteers all around the world. Tor Browser allows you to access blocked sites. You can use this browser on Microsoft Windows, Mac OS, and Linux computers without installing it. This browser can also run off a USB flash drive. You can download the Tor Browser here. Just open Tor Browser and visit the blocked website. It allows you to use the Internet anonymously and circumvent censorship. Tails forces all Internet connections to go through the Tor network. You can download Tails here. You can install Tails on a USB flash drive, then boot a computer from the USB flash drive, open the web browser and visit the blocked website. A proxy site is a website hosted on a server that redirects your web browsing activity. A proxy site acts as an intermediary between you and the website you want to visit. You can use proxy sites to access blocked websites. 1. Visit any of the proxy sites listed below. 2. Enter the URL (web address) of the website you want to unblock (e.g., www.reddit.com, www.spotify.com, etc.). Note: Some companies, schools, or countries block proxy sites, and they might update their list of proxy sites regularly, so you might want to make a list of proxy sites. Sometimes only the URL of a website is blocked (e.g., www.facebook.com, www.twitter.com, etc.). You might still be able to visit the website by its IP address (e.g., 206.189.189.27). Note: There are websites that cannot be accessed by their IP address. 1. Visit any of the online services listed below. 2. Enter the URL (web address) or domain name of the website (e.g., reddit.com, www.spotify.com, etc.). The group of numbers is the IP address of the website (e.g., 185.60.218.35). In this example, I'll be using Facebook. 1. Open the Windows Command Prompt. 1. Open the Mac OS X Terminal. 1. Open the Mac Network Utility. 2. Open the Ping tab. 3. Type the site's domain name (e.g., facebook.com, twitter.com, yahoo.com, etc.). 5. Set the number of pings to 1. 6. Click on the Ping button. Maybe the URL (web address) of the website you want to visit is blocked, but converting the URL to another shorter URL with the help of a URL shortener might help you access the blocked site. 1. Visit any of the URL shorteners listed below. The URL shortener will now create a custom short URL, and this URL can be used to visit the blocked website.